Mange, a serious disease in red foxes, is caused by mites that burrow beneath skin, making it inflamed. Foxes scratch for relief from the intense itching, and that allows secondary bacterial infections to invade damaged skin. Sarcoptic mange, the type that affects foxes, often fatally infects pups in summer and can spread between different types of animal. Gray foxes have a natural resistance to the disease. Mange mites feed and breed beneath fox skin, causing it to wrinkle and thicken. Fur can thin or fall out completely, and scabs appear. Foxes who are seriously infected are thin and weak and have wet, foul-smelling skin crusts. Sarcoptic mange mites favor the face, ears and feet. As the disease progresses it spreads over the trunk and legs. Young animals are particularly at risk because they have weak immune systems. Eye infections cause eyelids to turn inwards and scratch the cornea. Sarcoptic mange can be fatal in red foxes. Severe eye, mouth and ear infections cause death from starvation because blind or deaf foxes can't hunt, and mouth infections make eating difficult. Infected feet are painful to run on, and the thinning of fur causes death from exposure. Mange is responsible for red fox population declines in several states. The Illinois fox population has not yet recovered from a mange epidemic of the 1960s and 1970s. Treatments for mange include mite-killing oral medications and antibiotics to treat secondary bacterial infections. Antibiotic ointments and warm compresses, applied locally, also help alleviate symptoms. Veterinary surgeons can correct permanently turned in eyelids. Sarcoptic mange can spread to humans, so precautions such as washing hands and wearing rubber gloves are advised when handling infected animals. 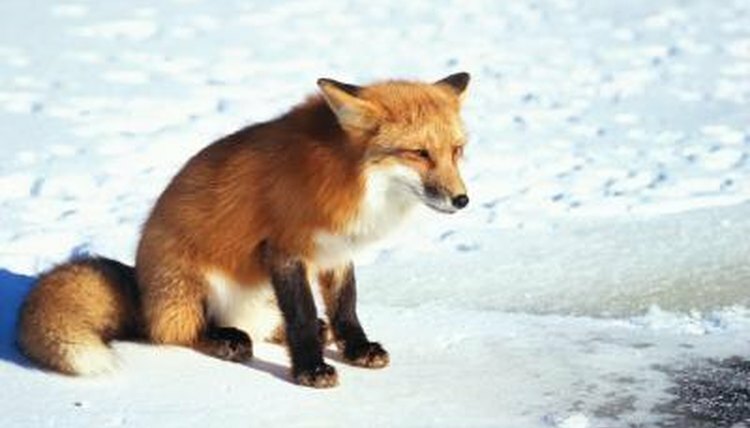 The presence of infected animals means mites are probably already widespread, so killing diseased foxes might not prevent the spread of infection, according to the Michigan Department of Natural Resources. Sarcoptic mange spreads through shared burrows and body contact. Mites don't have one preferred host. According to the Michigan Department of Natural Resources, there have been some cases of mange transmission from foxes to dogs. Dogs could catch the disease from approaching dead animals or when investigating burrows, as mites survive several days without hosts. Although mange is very contagious, dogs rarely come into body contact with live foxes. What Is the Difference Between a Chigger & a Redbug? Are Red Foxes Endangered or Extinct? What Kind of Foxes Live in Ohio?